The fifth Saratoga (CV-60) was laid down on 16 December 1952 by the NewYork Naval Shipyard, New York City, N.Y. launched on 8 October 1955, sponsoredby Mrs. Charles S. Thomas; and commissioned on 14 April 1956, Capt. R. J.Stroh in command. For the next several months, Saratoga conducted various engineering,flight, steering, structural, and gunnery tests. On 18 August, she sailedfor Guantanamo and her shakedown cruise. On 19 December, she reentered theNew York Naval Shipyard and remained there until 28 February 1957. Uponcompletion of yard work, she got underway on a refresher training cruise to the Caribbean before entering her home port, Mayport, Flab. On 6 June, President Dwight D. Eisenhower and members of his cabinet boarded Saratoga to observe operations on board the giant carrier. For two days, she and eighteen other ships demonstrated air operations, antisubmarine warfare, guided missile operations, and the Navy's latest bombing and strafing techniques. Highlighting the President's visit was the nonstop flight of two F8U "Crusaders," spanning the nation in three hours and twenty-eightminutes, from the Bon Homme Richard (CVB-31) on the west coast to the flightdeck of the Saratoga in the Atlantic. The carrier departed Mayport on 3 September 1957 for her maiden transatlantic voyage. Saratoga sailed into the Norwegian Sea and participated in operation"Strikeback," joint naval maneuvers of the North Atlantic TreatyOrganization countries. She returned briefly to Mayport before enteringthe Norfolk Naval Shipyard for repairs. On 1 February 1958, Saratoga departed Mayport for the Mediterranean andher first deployment with the Sixth Fleet. From this date through 31 December 1967 she was to spend a part of each year in the Mediterranean on a totalof eight cruises. The remainder of the time, she either operated off thecoast of Florida or was in port undergoing restricted availability. While deployed with the Sixth Fleet on 23 January 1961, a serious fire broke out in Saratoga's number two machinery space which took seven lives.The fire, believed caused by a ruptured fuel oil line, was brought under control by the crew, and the ship proceeded to Athens where a survey ofthe damage could be made. On 2 January 1968, Saratoga sailed for Philadelphia and an overhaul andmodernization program which was to last 11 months. On 31 January 1969, she departed Philadelphia for Guantanamo, via Hampton Roads and Mayport, andextensive refresher training of the crew and air detachments. 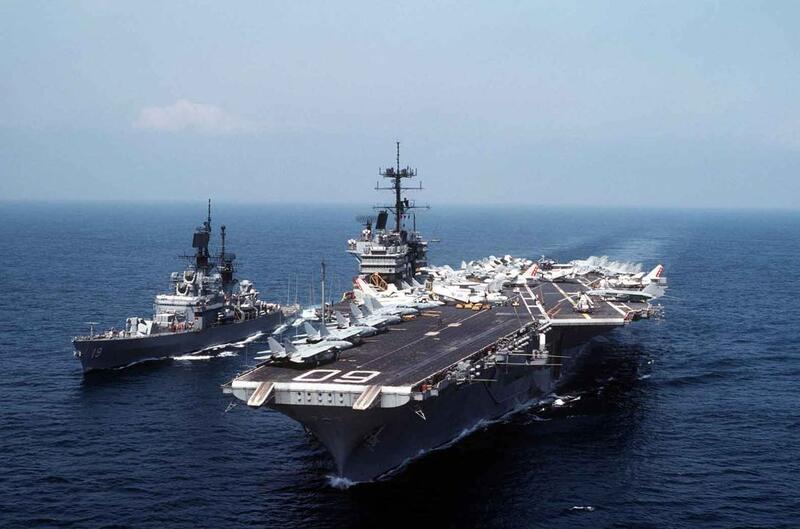 On 17 May, Armed Forces Day, she was the host ship for President Richard M. Nixon during the firepower demonstration conducted by Carrier Air WingThree in the Virginia Capes area. On 9 July, she departed Mayport for herninth Mediterranean deployment. Underway, a Soviet surface force and a "November" class submarine passed in close proximity, en route to Cuba. Off the Azoreson 17 July, Saratoga was shadowed by Kipelovo based Soviet aircraft. Theywere intercepted, photographed, and escorted while in the vicinity of the carrier. She operated with Task Group 60.2 of the Sixth Fleet in the eastern Mediterranean during September in a "show of force" in responseto the large build-up of Soviet surface units there, the hijacking of a Trans World Airlines plane to Syria and the political coup in Libya. Numerous surveillance and reconnaissance flights were conducted by Carrier Wing Three aircraft against Soviet surface units, including the carrier Moskva, operating southeast of Crete. Saratoga operated in this area again in October because of the crisis in Lebanon. She returned to Mayport and the Florida coast from 22 January until 11 June 1970 when she again sailed for duty with theSixth Fleet. On 28 September, President Richard M. Nixon and his party arrived onboard. That night, word was received that Gamal Abdul Nasser, President of the United Arab Republic, had died; an event that might plunge the entire Middle East into a crisis. The intelligence and communications personnelof the Saratoga were required to supply the President, Joint Chiefs of Staff,and the Secretaries of State and Defense with the essential intelligence information to keep them abreast of the deteriorating situation. The Presidential party departed the ship the next evening, and Saratoga continued on patrolin the eastern Mediterranean until she sailed for the United States on 2 November. From her arrival at Mayport until 10 March 1971, she was in a"cold iron" status. She then operated off the Florida coast until7 June when she departed for her eleventh deployment with the Sixth Fleet,via Scotland and the North Sea where she participated in exercise "MagicSword II." She returned to Mayport on 31 October for a period of restricted availability and local operations. On 11 April 1972, Saratoga sailed from Mayport en route to Subic Bay,P.I., and her first deployment to the western Pacific. She arrived in SubicBay on 8 May and departed for Vietnam the following week, arriving at "Yankee Station" on 18 May for her first periodon the line. Before year's end, she was on station in the Tonkin Gulf a total of seven times: 18 May to 21 June, 1 to 16 July; 28 July to 22 August;2 to 19 September, 29 September to 21 October; 5 November to 8 December; and 18 to 31 December. During the first period, Saratoga lost four aircraft and three pilotsOn the plus side, on 21 June, two of her "Phantoms" attacked threeMiG 21's over North Vietnam. Dodging four surface to air missiles, theymanaged to down one of the MiG aircraft. Saratoga's planes attacked targetsranging from enemy troop concentrations in the lower panhandle to petroleum storage areas northeast of Hanoi. On her second line period, she lost an F-4 to enemy fire northeast of Hanoi with the pilot and radar intercept officer missing in action. During this period, her aircraft flew 708 missions against the enemy. On 6 August, Lt. Jim Lloyd, flying an A-7 on a bombing mission near Vinh,had his plane shot out from under him by a SAM. He ejected into enemy territoryat night. In a daring rescue by helicopters supported by CVW-3 aircraft,he was lifted from the midst of enemy soldiers and returned to the Saratoga.On 10 August, one of the ship's CAP jet fighters splashed a MIG at night using "Sparrow" missiles. During the period 2 to 19 September, Saratoga aircraft flew over 800combat strike missions against targets in North Vietnam. On 20 October,her aircraft flew 83 close air support sorties in six hours in support ofa force of 250 Territorials beleaguered by the North Vietnamese 48th Regiment.Air support saved the small force, enabled ARVN troops to advance, and killed 102 North Vietnamese soldiers. During her last period on station, Saratoga'saircraft battered targets in the heart of North Vietnam for over a week. On 28 September 1980, only one month after her return from deployment, Saratoga departed Mayport and headed north to the Philadelphia Naval Shipyard where she underwent the most extensive industrial overhaul ever performed on any Navy ship. Saratoga was the first ship to go through the Service Life Extension Program (SLEP) overhaul that would last 28 months. She conducted sea trials on 16 October 1982, and left Philadelphia with much fanfare on 2 February 1983 with her new nickname — "Super Sara." On orders from President Ronald Reagan, seven F-14 Tomcats from the VF-74 "Bedevilers" and VF-103 "Sluggers" were launched from Saratoga. Supporting the Tomcats continuously were VA-85 KA-6D air tankers and VAW-125 E-2C Hawkeye aircraft. Off the coast of Crete, the F-14s, without the use of running lights, eased up beside and behind the airliner. On command, the Tomcats turned on their lights and dipped their wings — an international signal for a forced landing. The E-2C Hawkeye radioed the airliner to follow the F-14s. Realizing they were in a "no-win" situation, the hijackers allowed the pilot to follow the Tomcats to Naval Air Station, Sigonella, Italy. Saratoga's 21st Mediterranean deployment, which began 6 May 1992, was much more than normal operations in the Med. Her six month deployment found her in the Adriatic Sea, providing close-air support for humanitarian relief flights flying into the war-torn former Yugoslavia. Thousands of support missions were flown, but more importantly, not one single piece of ordnance was dropped — proving that U.S. military presence is a powerful deterrent. On 27 August, aircraft from Saratoga and USS Independence (CV 62), both in the Arabian Gulf, began enforcing the no-fly zone south of the 32nd parallel in Iraq under Operation Southern Watch. Any Iraqi warplanes violating that airspace would be shot down. This was to prevent the Iraqis from attacking Shiite Moslem ethnic groups in the marshes of southern Iraq. From the Gulf, Saratoga returned to the Mediterranean and was there relieved on 7 October by USS John F. Kennedy (CV 67). Completing the exercises, the Saratoga/CVW17 team returned to the Adriatic for five more days of flying in support of Deny Flight and Provide Promise. Departing "Groundhog Station" 7 April , Saratoga transited the Straits of Messina between Sicily and the toe of the "boot" of southern Italy, for a port call at Naples, Italy, before returning to the Adriatic for the fourth time on 17 April. Saratoga arrived pierside at Naval Station, Mayport, Fla., early in the morning of 24 June 1994. With the end of the 164-day deployment — the last in the carrier's 38-year career — Saratoga's crew prepared to deactivate the ship, offloading material and closing out each of the ship's more than 3,500 spaces. Saratoga was decommissioned at the Naval Station, Mayport, Fla., 20 August 1994, and was stricken from the Navy List the same day. Chief of Naval Operations Adm. Mike Boorda was the keynote speaker at the decommissioning. Saratoga was towed out of the Naval Station Mayport basin on 22 May 1995 and taken to Philadelphia to become part of the Navy's inactive fleet. In 1998, upon the deactivation of the Philadelphia Navy Yard, she was towed to Newport, R.I., departing 3 August and arriving at the Naval Education and Training Center on 7 August 1998. She was first placed on donation hold, then her status was changed to disposal as an experimental ship. Saratoga was returned to donation hold on 1 January 2000. The city of Jacksonville Florida wanted her to become a musuem but failed to raise the funds. The ship was was scrapped at Esco Marine Ship recycling plant in Brownsville Texas in 2014.